It is inevitable that as soon as a scary diagnosis happens and you are facing surviving a traumatic event, you will hear the phrase "Be Positive". And, it is important to note, you can not underestimate the difference positivity can make on your survival. You hear stories all the time about how being positive had a direct affect on getting through a life-changing event. However, you very rarely hear about the importance negativity plays in a struggle. And the truth is, there is a definite place for the heavier dark side as well. This, like all things, has a balance and it is key to finding strength in both the positive and its polar opposite. 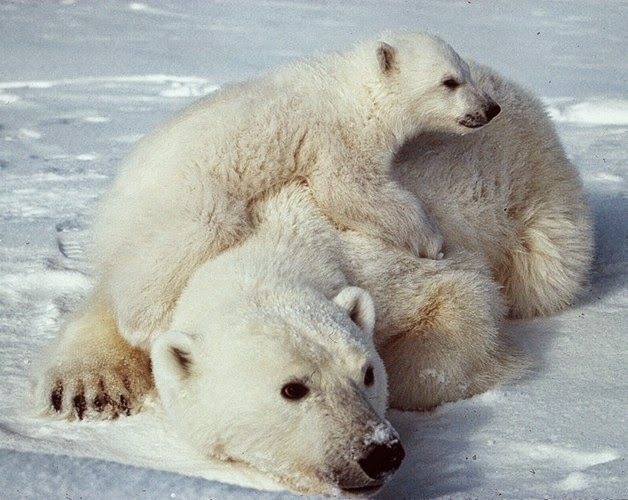 There is great power in the Yin Yang of these Polar Bears of Survival. If you are lucky enough to have any preparation time for what you are to face, you need to educate yourself, prepare for, and in some way embrace both the Best Case Scenarios and the Worst Case Scenarios. There is a very valid reason why. At your weakest points, you are the most vulnerable to having the wind and will knocked out of you by something you were unprepared for. It can be very hard to catch your breath again and recover intact from these surprise attacks. Even small set-backs can be devastating and alter the view of your journey when you are in the middle of a fight for your life. So, face your struggle positively. Focus on the light at the end of the tunnel, no matter how far away it seems. Find grace and beauty even amid the hardship. Allow yourself to retain your ability to laugh and smile. Forgive yourself and others any missteps along the way. Remain open to love and support, and, most importantly, hope. This can get you through more than you ever imagined. It is vital to healing and your very survival. When you focus on the light, also be aware of shadows that could pop up and slow your progress through the tunnel, so you can better move through or around them. When you are finding grace and beauty, also allow yourself to be accepting of the ugly sides to better avoid some of the guilt and shame they can bring which can be crippling. Forgive yourself and others for missteps, but also prepare for obstacles that could occur to better allow yourself the time and understanding to maneuver through them. Remain open to the love, support, and hope, while also making choices for yourself and your future as to what you want should things take a less than positive turn, to better allow you the chance to focus during the most difficult parts of your struggle, because you prepared in advance. You can choose life. Face every day with the belief and truth within yourself that you will survive. You will heal. Be positive. But it is not defeatist to also draw up a will (or discuss a living will) with your doctors and family. So that should a time come when you can not express your wishes, these important decisions are not made without your choices being known and respected. It is not wrong to ask about what the worst case scenarios could be, so that you can forge a plan for how you might face that outcome and allow yourself some breathing room should the best case scenario you are focused on not pan out exactly as you hoped. It is not negative to take a moment to tell those you love that you love them and share something special with them, in case you do not have another opportunity. You want to make a path that allows you, and the people who care about you, the least room for regret. So that should the journey you are on take a different route then you fought for, you have the peace of mind to accept and adjust your focus to continue your journey on a new course, without being further destroyed or your progress delayed by being unprepared. Inhale the positive and exhale the negative. Allow yourself the freedom to find strength in both. Find the balance of the polar bears and breathe brave.